Diabetic cardiomyopathy (DiabCM) occurs commonly in diabetes, it reduces cardiac reserve and there is no specific treatment. The aim of this study was to determine whether the cholesterol lowing agent fenofibrate and incretin mimetic liraglutide can prevent preclinical structural changes of DiabCM. C57BL/6 male mice were fed either a high fat diet (HFD:45%kCal fat) or standard chow(Chow:12%kCal fat). After 15wks some had type 2 diabetes (DM) induced with STZ to 3x65mg/kg then some were treated with either dietary fenofibrate ad libitum (100mg/kg of food) or 5 days/week liraglutide injection (200mcg/mouse s.c.) for 10wks. Heart H&E and Picrosirius Red staining was assessed. Gene expression of collagens-I and -III and pro-inflammatory MCP-1, IL-6, and TNF-α were analysed by qRT-PCR. Fenofibrate and liraglutide reduced body weight in HFD and improved random blood glucose levels in DM animals (not shown). 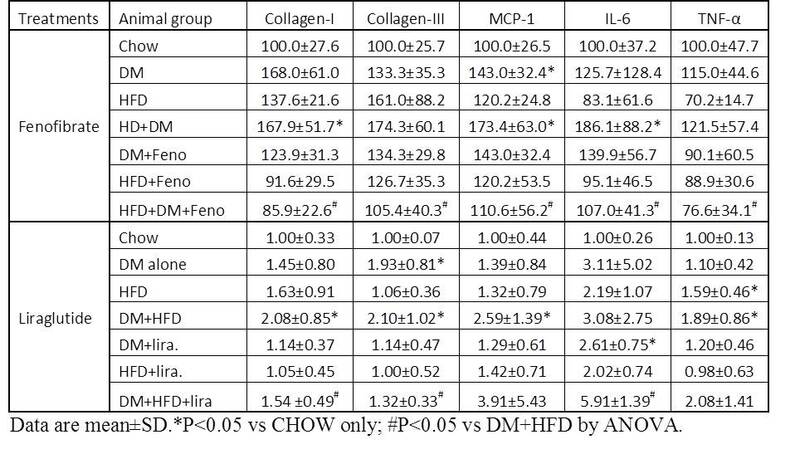 Fenofibrate inhibited both fibrosis by PSR, collagen-I, –III and inflammatory genes otherwise induced in the DM+HFD group; while liraglutide inhibited the fibrosis, but not inflammatory gene induction (table). Cardiac function was not detectably impaired in this model. This model shows fenofibrate and liraglutide had similar protective effects on the pro-fibrotic, but different profiles in the inflammatory changes of DiabCM.